Are helmets required for skiing or snowboarding? Can we get the kids ski free discount on top of our advanced reservation discount? Do you offer Free helmet rentals for kids? Do you offer Rest Days, when renting gear? How early can we pick up our rental equipment? Optional Damage Insurance on rental gear? Where is you shop located? Helmets are not required to ski or snowboard on the Steamboat ski area. Helmets are required for any skiers or boarders 17 or younger that will taking lesson in the Steamboat ski school. Powder Pursuits will provide helmets for free to any juniors taking ski school where helmets would be required. Helmets will be included for free for any rentals of 4 days or longer for adults and juniors even if they are not in the ski school. Kids ski free discounts do not overlap with any other existing discounts. If the family has skiers that are not eligible for the kids ski free package the discount will be applied to those skiers. Depending on the value of your discount we always try and figure out if the kids ski free package or the discount for the entire family is the least expensive. We like to apply whatever works out to be the least expensive for the customer. Powder Pursuits provides one grace or rest day for rentals up to 5 days. On a grace or rest day the customer will be allowed to hold on to the equipment for no extra charge on the selected day they are not skiing. It is on the honor system that they will not be skiing on that day. All rentals of 5 days or longer will be given 2 grace or rest days that they will be able to keep the equipment on for no extra charge. All Kids 12 or younger will receive free helmets with their rentals. Any adult helmet rental of 4 days or longer will only pay the 4 day price. 1 and 2 day rentals are consecutive days, 3 and 4 day rentals allow 1 grace day, and 5 or more day rentals allow 2 grace days. All rentals may be picked up after 3pm the day before the rental is to begin. If the renter wants to night ski the night they pick up that will be a seperate charge from the next days ski rentals. Night skiing rates are half price of the regular day rates. All rentals are expected to be returned by 6pm the night of the last day rented. Late returns may face a fee especially during peak season due to the high volume of turnaround on rental equipment. For kids 12 & under (with shoe size of 6 or less) accompanying a consecutive 3 day adult full retail priced rental. 1 kid per parent. Proof of age required for all kids 11 or 12 years old. The optional damage waiver covers only repairable breakage or damage of equipment included in this order. It does not cover loss or theft or personal injury. The damage waiver also does not cover total destruction of the equipment (so don't ski down the road or hit large jumps without the ability to do so). The damage waiver will cost $3 per person per day. 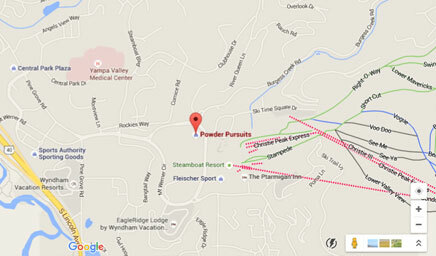 Powder Pursuits is located at the base of the Steamboat Ski area. Powder Pursuits is on of the shops in the street level of the Steamboat Grand hotel. Directly across the street from the Gondola transit center Powder Pursuits is 300ft. from the entrance to the Gondola.